Korea's robotics industry is in the news again. In an article entitled "Korea ups its robotics game," Businessweek reported that "South Korea is embracing robotics with the same intensity that made it a force in high-speed broadband, widescreen televisions, and smartphones. 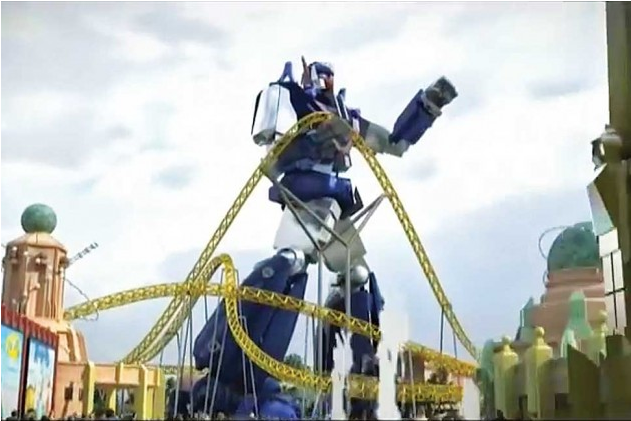 Robot Land, a state-subsidized 758 billion won ($735 million) theme park featuring futuristic rides as well as research and development labs, is set to open in 2016. The government is also investing 1.1 trillion won to support the nation’s robotics industry. That industry has doubled in size since 2009, with revenue reaching 2.1 trillion won in 2012, according to the Ministry of Trade, Industry and Energy." Most of the robots in South Korea to date are industrial ones. 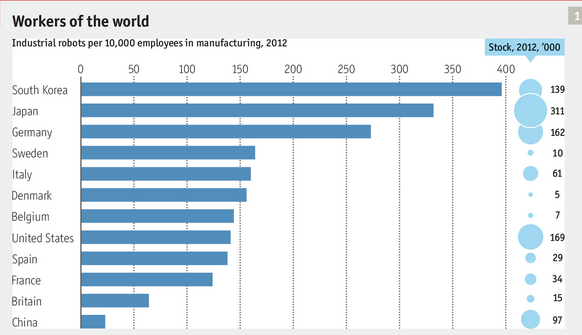 As shown in the accompanying bar chart published by The Economist, Korea has more industrial robots per employee than any other country. (click to see a full-size version) It is now becoming clear that robots have uses and applications across many sectors of industry, the economy and society. With its aging population, Korea hopes to make much greater use of service robots here at home and to export these services to other nations. This is where Korea's world-leading broadband infrastructure and its strong online game industry come into play. In April of this year a report by the state-run Korea Finance Corporation received quite a bit of attention. It noted that the country's export of computer and mobile games accounted for 57 percent of South Korea's overseas shipment of cultural goods, which came to $4.6 billion in 2012. The many benefits of networked robots, including the service variety, are not difficult to imagine. In fact, the military drones used so extensively by the U.S. in recent years represent one type of networked robot. However, if one thinks instead of a humanoid robot caring for an elderly parent or relative at a distant location, then the application of techniques from the increasingly immersive and involving world of online games comes into play (no pun intended). Korea is already a world leader in broadband networks, and highly competitive in both the robotics and online games industries. It appears highly likely that these industry sectors will converge, and with related developments will shape future networks. Speed matters: check it with Ookla's open data!